Alazraqui, Roger Craig Smith, Anthony Edwards, Val Kilmer, Sinbad, Gabriel Iglesias, Brent Musburger, Colin Cowherd, Danny Mann, Oliver Kalkofe, John Ratzenberger. 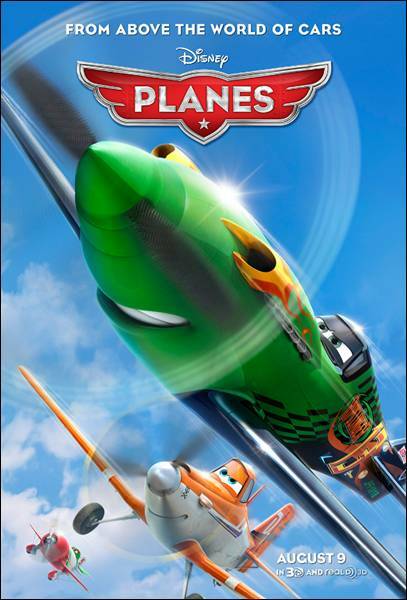 DISNEY’S PLANES in theaters August 9, 2013. From above the world of “Cars,” “Disney’s Planes” is an action-packed 3D animated comedy adventure about Dusty (voice of Dane Cook), a plane whose high-flying dream gives a spellbound world the inspiration to soar. Here is the trailer for Disney’s PLANES. The animated movie is directed by Klay Hall, starring the voices of Dane Cook, Stacy Keach, Brad Garrett, Teri Hatcher, Cedric the Entertainer, Julia Louis-Dreyfus, John Cleese, Carlos Alazraqui, Priyanka Chopra, Gabriel Iglesias, Roger Craig Smith, Colin Cowherd, Sinbad, Oliver Kalkofe, Brent Musburger, Anthony Edwards, Val Kilmer. Here is a new video “Disney’s PLANES Takes Flight,” featuring music by the film’s composer, Mark Mancina. The animated movie is directed by Klay Hall, starring the voice of Dane Cook. Here is a sneak peek for Disney’s PLANES. The animated movie is directed by Klay Hall, starring the voice of Dane Cook. Here is the poster from DISNEY’S PLANES. The animated movie is directed by Klay Hall, starring the voice of Dane Cook.